When Mirova* was launched back in November, its offering, built on 4 pillars (Listed equities, Impact investing**, Voting and engagement, and Infrastructure) was rounded out with the expertise of Natixis Environnement & Infrastructures for the Infrastructure pillar. This expertise is now adopting the Mirova brand: Natixis Environnement & Infrastructures was renamed Mirova Environment and Infrastructure on 7 February. /// What are the missions of Mirova Environment and Infrastructure? Mirova’s Infrastructure team comprises a dozen professionals. Their mission is to finance infrastructure projects that address sustainable development issues and generate regular cash flow over the long term. At end-December 2012, the Infrastructure team therefore managed total assets of more than €360 million, split between four investment funds dedicated to renewable energies and public-private partnerships in Europe: Fideme, Eurofideme 2, FIDEPPP and FIDEPPP 2. /// How will the Infrastructure pillar be organised? - Investment funds in the European renewable energy sector (wind,solar, biomass, etc.). - Low volatility asset portfolios aiming to generate recurring and high yields. - 1.4 million tons of CO2 emissions saved thanks to 585 MW of clean energy projects financed. - Investment funds in public utility projects under public-private partnerships. - Financing of a wide variety of infrastructure projects in France (universities, stadiums, hospitals, urban and rail transport, etc.) with high yield potential. - Significant participation in public-private partnership projects totalling close to €6 billion. * Mirova is a brand of Natixis Asset Management. 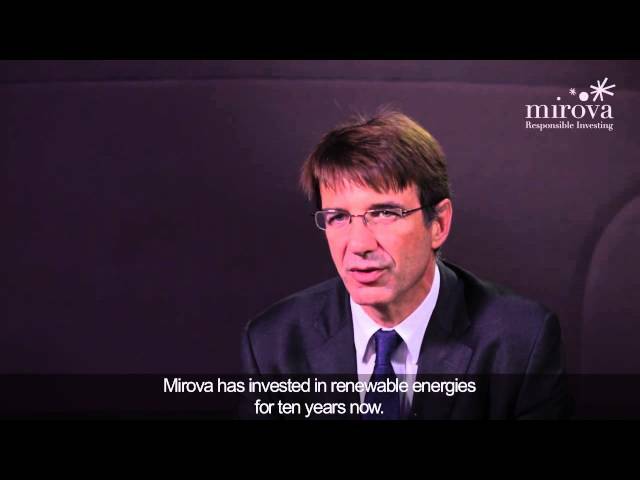 Mirova, the responsible investment division of Natixis Asset Management, aims to provide solutions to clients who are concerned about the sustainability of their investments, in order to create long-term value.
. Read more at www.mirova.com and on Twitter @Mirova_RI. ** Investing with a social and/or environmental impact.